Once again we seem to a have similar things on our minds Jeremy! Today I spent some time writing about Ken Russell's Tommy and I started thinking about his films a lot. The Devils has long been my favorite Russell film. As matter of fact it would easily make my list of Top 10 favorite films of all time. I really love Russell's movies and I think he's a terriblly unappreciated director. My second favorite Russell film is the Music Lovers and that's not on DVD either. And while I'm complaining... where are the Region 1 DVDs for The Boy Friend, Lisztomania,Valentino and The Rainbow? It's really shameful that Russell's filmography is so criminally neglected. Someone needs to release a Boxset of his films and soon! Russell is not getting any younger and I'm sure he'd happily contribute commentary and in-depth interviews to any DVD presentation that was released. Sorry about the soapbox rant, but it really bothers me that so many of films are unavailable. It really is crazy how many of his films, including several of his best, are not available. I would add to your list of Russell wants his 1964 feature "French Dressing" with Marissa Mell, "Savage Messiah" from 72, and "Whore" from 91 with Theresa Russell. A box set would be incredible or at the very least some decent special editions of his most important films. I really need to see French Dressing. It's just crininal how neglected Russell is and it's a shame that so many of his films are so hard to get a hold of. I'm there on the 'Ken Russell Appreciation Society' Kimberly, the man is incredibly undervalued. "French Dressing" is one of the only ones I haven't seen, just a handful of clips that makes me think I really need to. I want to join the "Ken Russell Appreciation Society"! I'm a huge fan and was recently - maybe a month ago? - trying to show his brilliance to others and was disappointed how little was available on DVD. What a terrible shame. I've never seen anything by Russell that I wasn't utterly compelled by, even some that I saw before I was necessarily old or wise enough to understand all of the complexities of. Glad to see the 'Ken Russell Appreciation Society' already has three members. I know what you mean about noticing the complexities of his films. I saw several when I was much younger and it's just as I have gotten older that I really understand just how significant and brilliant they are. Thanks for your comments, perhaps between you, Kimberly and I, we can spread the word about how great Ken and his films are. 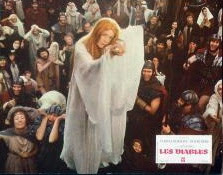 "The Devils" has been a film of Ken Russell's I always thought would be fascinating to see. This trailer just made me want to see it more. I've been a fan of the other films of his I've seen, including "Gothic," "Lair of the White Worm," and "The Rainbow." Ken Russell is an extraordinary filmmaker.